OPTICAL WEBSITE - Social Media Integration. Our Social Media Integration is specifically designed for those in the optical field. Our Social Media specialists analyze your competitors in addition to your needs for a campaign specifically designed for your success. Social Media Marketing and Integration is so much more than just "plugging" products on Facebook. It's about maintaining new and fresh content, building organic relationships, and making use of the tools that Social Media websites have to offer, like calendars, links, email blasts, images tags and more. Reputation management and "clean" internet directory listings are an imperative and integral piece of social media marketing that is too often ignored, overlooked or not understood. Our proprietary Local Marketing Solution is an all-in-one solution that makes online marketing simple, effective and affordable for the local Eye Care Professional. Social Media Integration or Social Media Marketing (SMM) is complicated for sure, but with our customized strategic targets combined with Social Media Integration skills we can design a campaign that will get results! Facebook, Twitter, FlickR, Yelp, Merchant Circle and Blogs just to name a few, are social media sites that we can work with to complete your Social Media Integration. The Power of Social Media can work for you, or against you. 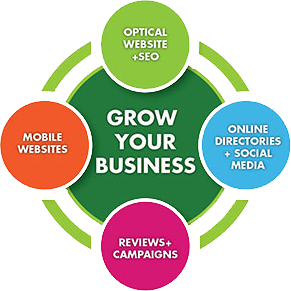 With EyeVertise's expertise in these mediums we will expand your online presence. To do it right and get the most out of your Social Media Marketing Campaign, one person can't successfully shoulder that responsibility alone and asking office staff who may know something about posting on a Social Media website may mean well, but they may not be equipped to get the best possible response from your Social Media Campaign.